Arrrhhh it’s the weekend (nearly) and what happens at the weekend? Well one of two things that involve the entrance of your home. 1) You either arrive home and dump your worries from the week at your front door and put your feet up. 2) You pack yourself a bag of goodies turn on the alarm and head out and about to see the world- either way it starts or finishes in your entrance- so make it pretty. IMPORTANT! Making an impact in this small space is simple – you don’t have to over think it- just make sure you don’t neglect it all together! I love the use of a smart stripe and a floral print to add some personality – if the fabric on the bench seat turns old in years to come you will still love the stripes and can update quickly and easily. One of the best ways to use this idea is if you enter your home into a wide open plan space – creating an entrance area will provide a sense of breaks in the space and allocated areas for each activity. Help keep this clutter free with a hat stand, coat rack or some clever storage boxes- its inevitable that you will place things in this spot so give them a designated home. 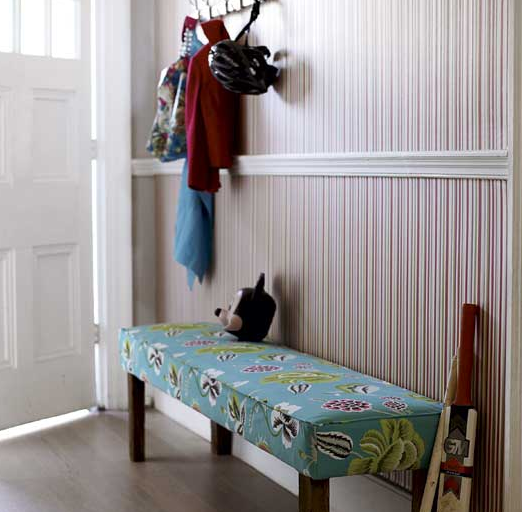 This bench seat doesn’t have to be very wide so you have a narrow tricky space this will work well. If you are short on storage consider adding some boxes under the bench or use a covered shoe box in the same way. If you don’t want to introduce a patterned seat (which is exactly why I love this shoot- but horses for courses) try a lovely long rustic wooden bench. For those regular readers this is a similar idea as Styling Idea # 11 Shoe Seat – but easier to do today and change tomorrow! 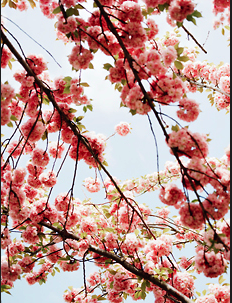 Okay, here we go for the order of the day with cherry blossoms! My sister got this botanical tattooed on her arm because it means feminine power and beauty- can something this incredible represent anything else? Get something pretty not naff – that means if it is an Asian style replicable print of the plant that focuses more on the branch than the flower and is predominately in red it is probably not pretty enough and will let cheap- be careful. Photos of the real thing are a good place to start- full bloom, large and fluffy. Any interior, any space, any time will work with this. You wont see any cherry blossom here, more likely to be oleander (my landscape designer friend will either slam more or applaud my botanical references) but I think everyone fantasies about a place like to sit on a Friday. Yesterday I started my new job at Vampt Vintage – how wonderful (if you need a casual gig to pay the bills why not at your favourite store?). If you have not spent at least the equivalent of two days searching through their impeccable collection of vintage furniture than call in sick today and do it! Or get there this week for 20% off stock at the new Brookvale store. To be around such craftsmanship and true classics almost makes you want to rethink your design philosophy. 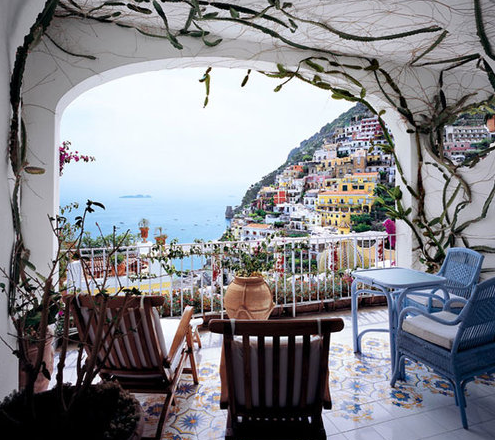 What do you buy, how do you invest and what is it that makes a truly breath taking space? I think part of the answer for me is the ability to combine timeless classics with a modern freshness. Something so desirable in today’s eye skimming world that is causes you to stop, give an admiring head tilt and take notice. I truly love the connectivity in this space between modern florals, classic florals, white space and retro furniture. 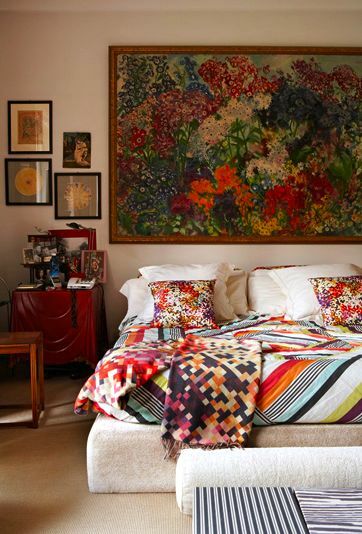 You must must must go larger than life with the florals here over the bed- no pretty soft prints allowed- you want drama and colour. Keep the walls and base linen white- clean and modern. Add retro danish side tables like these and hang an assortment of vintage and quirky frames above it. DO think about the size of your painting- it should be so big that is like a bedhead. The width should be close the the width of the bed if not the same size as it. DO hang the painting low- close enough to give the illusion of the bedhead but high enough to learn back against the wall. DO look for stripes, florals with various colour bases and small print florals to pull it together. DON’T be too fussy- this is a inspired look that works on the basis that florals generally go beautiful together- just like nature. DON’T use images of one large flowers alone- it’s too dated, even a defined group of flowers will be dated in this space. DON’T use prints if you can avoid it- search for real oils on canvas. DON’T limit yourself on your frames- although i do think a clean frame works well but be ornate if you feel fancy. DON’T be tempted to paint a floral painting yourself- chances are if you can paint floral it will not cut it in this look and space. This is Monet style and truly classic. We want dark backgrounds, moody flowers, heavy brush strokes and busy paintings that say Renaissance.